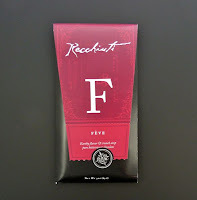 Today was Day #7 of Chocolate and Nibs Theme Week, and the first chocolate of the day was a Feve bar from Recchiuti (San Francisco, CA). Feve is a French word for bean or, in this case, many small pebble-sized pieces of unsweetened, roughly ground cocoa bean, or nibs, that hadn't yet been made into chocolate. 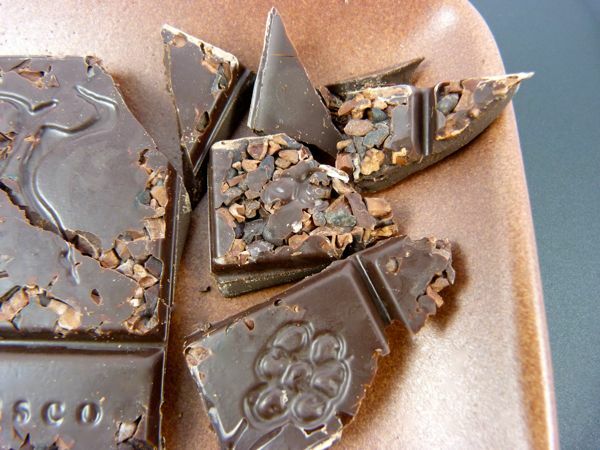 Cacao nibs gave this dark bar a crunchy, somewhat nutty texture. 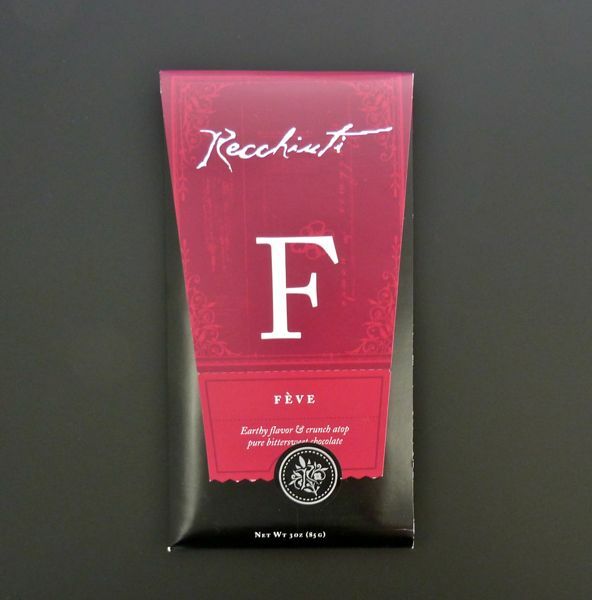 It was so richly textured with nibs, it was difficult to make out the stamped "R" and the name Recchiuti on the top side of this bar. 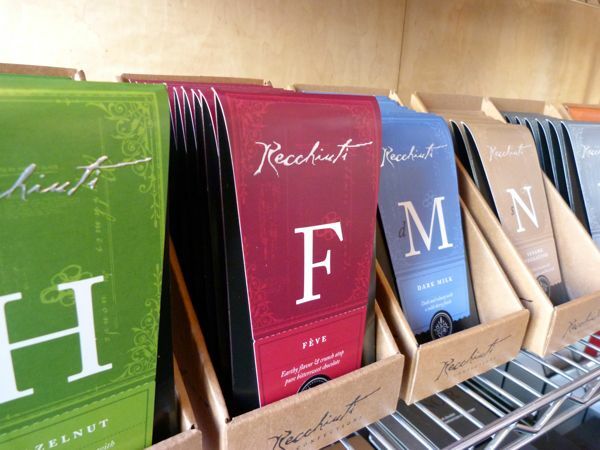 In search of more nib-related items from this chocolatier, I drove to San Francisco to investigate two new Recchiuti establishments. 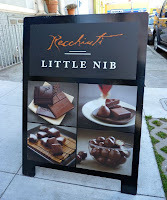 The Little Nib and the Chocolate Lab (a few doors down from each other in the Dogpatch neighborhood of the City) opened last September and November (2012), respectively. 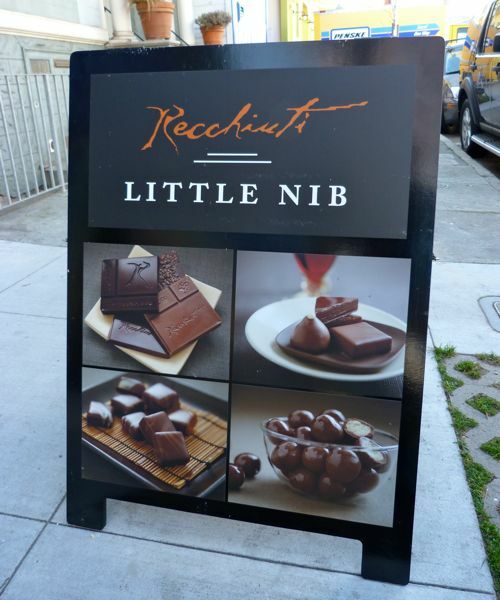 The former, Little Nib, was a small retail space that sold Recchiuti chocolates and bars. 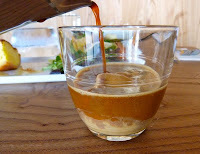 I knew I was in the right place, when the shop clerk pointed to a glass jar on the counter, with a metal scoop. 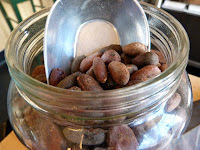 The jar was filled with almond-sized, dark brown, dried cocoa beans -- where nibs originate. 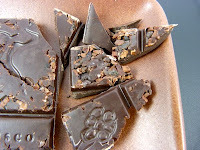 However, except for today's Feve bar, there were no other chocolates in the shop that featured cacao nibs. 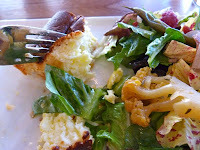 So, I moved on to the Chocolate Lab, a cafe with both savory and sweet dishes, to have an early dinner. 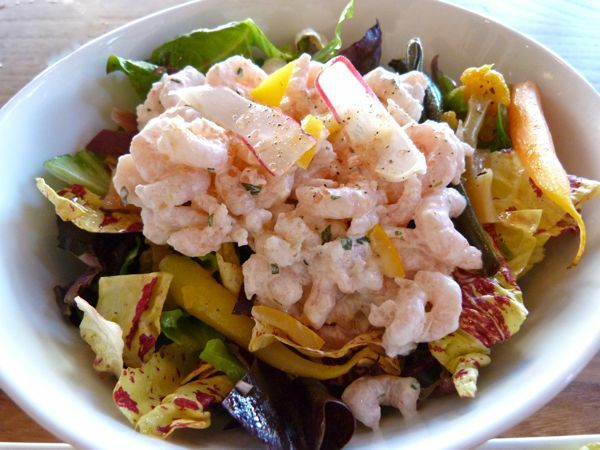 I've included pictures of part of a light, wedge-shaped piece of goat cheese souffle served with a pretty side salad and house-made pickled vegetables, and also a shrimp salad, just to prove that I occasionally eat something other than chocolate. 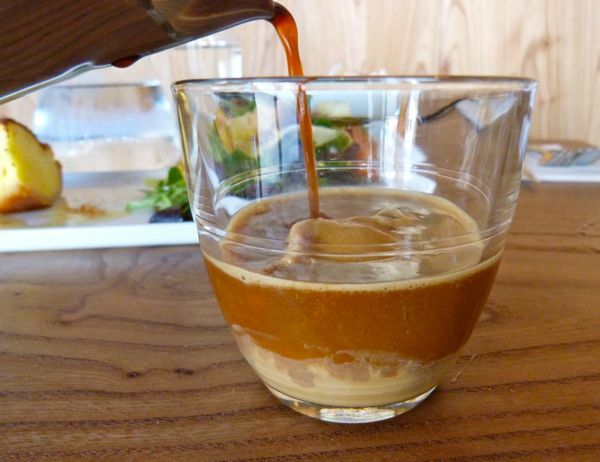 I also enjoyed an affogato with Recchiuti burnt caramel ice cream and espresso. But, let's face it, as tasty as these items were, I was here for the chocolate devil's food cake with the cacao nib infused foam on top. 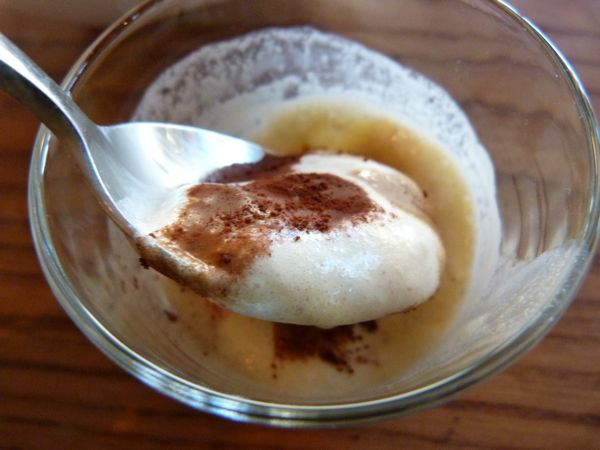 The Chocolate Lab Cake was sitting in a mahogony-colored pool of coffee creme anglais, topped with a fluffy, subtly flavored nib infused foam, and sprinkled with caramelized nibs. 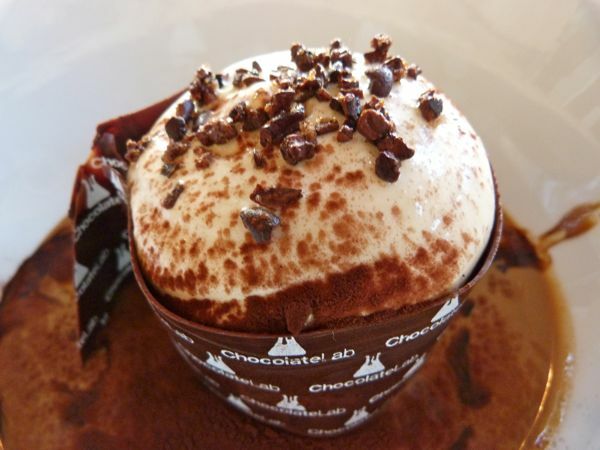 A collar of bittersweet chocolate (printed with the words Chocolate Lab) encircled the cake and foam. I bypassed the cake part (couldn't have gluten), but throughly enjoyed the richly appointed adornments: foam, nibs, chocolate and sauce. 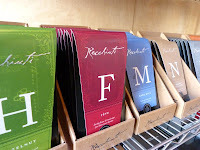 Thank you to the helpful staff who provided assistance with gluten-free options.